Pink Pepper and Pink Roses for a Family Memory! It was such a great evening Saturday 2 weeks ago when Eddie and I were invited to a delicious dinner with my uncle Dieter, Genee, Pete, Gill, Brendan and Christen-Jenna. It has been a while since we were able to catch up with family and we were able to share family news, reminisce and generally enjoy each other’s company. Genee is always a gracious and gorgeous host and her delicious roast dinner reminded me of the beautiful roast dinners my mom would prepare so lovingly and with a great deal of food-fussing about for us. 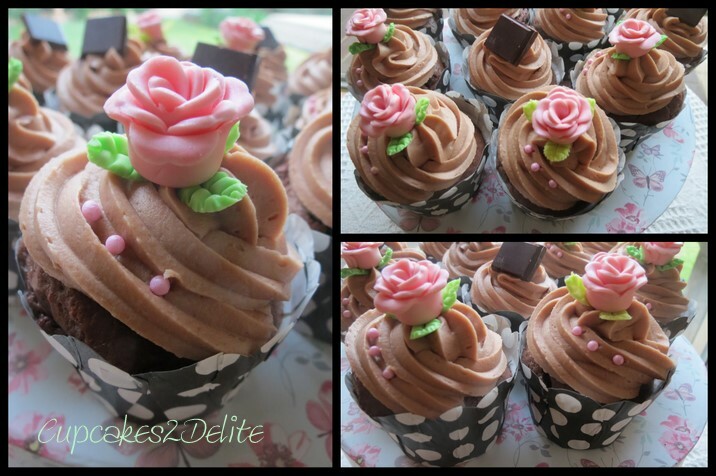 I wanted to make really pretty but fun cupcakes for Genee so I chose the pink pepper and citrus chocolate iced cupcakes that I have made before and added a pink rose and pink pearls to her cupcakes. Dieter has always been a chocolate lover and I remember him eating all the desserts I made when I was a child for family gatherings. He always had high praise for everything I made so I love him for that as I am sure there were times when not every dessert was up to scratch. For his cupcakes I added a piece of the Madacasse Pink Pepper and Citrus chocolate that I had melted into the icing. We enjoyed a beautiful dinner finished off with these cupcakes so once again thank you for inviting us to share in more family memories. Another work of art babes. It was great to catch up with the other side of the family after so long! Yes …. now you are back to 100% – these are beautiful!! Delighted you approve again … have to keep my fans happy too!